HERALD WAR REPORT: Adverts from the Morpeth Herald, September 1, 1916. In the course of an interesting letter to Mr Wm. Noble, Belmont House, Morpeth, Captain C. Taylor, A.V.C., a well known local veterinary surgeon, says: “I saw one of your nephews one day quite accidentally (that is the doctor one). He was looking quite well, and he told me his brother was a temporary major now, which is really a step in the right direction. “Regarding the war, as I have said before, you get the general news at least 24 hours before us, although anything doing immediately in front we get to know two days before you. “Although not far from the front I have splendid billets and very comfortable, which is something to be thankful for, and our food is excellent. “No doubt you will all be weary of the war, but rest assured, although the Boche is a hard nut to crack, he really has got a shaking up of late. I have seen several prisoners. They did not seem a bad lot, nor did they look as if they were starving, although they gave me the impression that they were not sorry they were out of it. Their appearance also leads me to believe that all their available manhood had been called to the colours. The above fund, initiated and carried on by several good ladies of the borough to provide “smokes” for the gallant Morpeth lads at the Front, has earned the grateful thanks of the boys. Every man of them wishes to thank the ladies for their thoughtful action. The boys, states the writer, are in the best of health. Through the kindness of the Co-operative Printing Society of Newcastle fifty wounded soldiers from Armstrong College were provided with an outing by char-a-banc on Wednesday. The wounded men were accompanied by several directors. They had a most enjoyable drive by way of Ponteland and Belsay. On the return journey the party halted at Morpeth, and had tea at the Co-operative Hall, the catering being in the hands of the Ashington Industrial Society. The excellent repast was greatly enjoyed by the soldiers. After a few words of welcome from the chairman, supplemented by a cheery address from Mr Wilkie, a miscellaneous programme was gone through. The hall was artistically decorated for the occasion, the flowers being kindly given by the Mayor (Ald. Ed. Norman). RISEBOROUGH.— Died of wounds received in action, July 20th, 1916, aged 33 years, John, dearly beloved son of Mary Ann and the late Robert Riseborough, of Cramlington. The Executive Committee of the Northumberland Miners’ Association, at a meeting at Burt Hall, Newcastle, on Thursday afternoon, received a communication from Mr Wilson, Chief Inspector of Mines for the Northern Division, saying that he had received a telegram from the Secretary of State for the Home Department, intimating that the holidays for munition workers, etc., did not apply to miners, and requesting Mr Wilson to make this known to the colliery owners and workmen in the district, so that the pits might be kept at work. Mr Wilson said he would issue a copy of the telegram to be posted up at all the pit heads in the county. The Executive Committee trust that the men will strictly observe the requirements as announced by the Home Office. The annual meeting of the shareholders of the Morpeth Gas Company was held at the works on Tuesday evening. Major Ralph Crawford (chairman of directors) presided. In moving the adoption of the directors’ report the chairman said that they had met that night with a much brighter outlook than they had twelve months ago, both from the national point of view and also from the point of view of the business of the company. It was true that the terrible war still hung over the country, and still very adversely affected a business such as theirs, but whereas a year ago they had not begun to win, now he thought that they might look forward with confidence to the future. He believed that the result of this war would be a great and glorious victory for this country, and they, at any rate, of this generation would be able to live in the future free from the German menace and free to pursue their peaceful avocations in this land of England. So far as the company was concerned, contrasting the profit now with a year ago, he must confess that he looked forward then — he would not say with apprehension, because the business of the company was so strong that there no cause for apprehension — with a certain amount of gloom to the future. Of course, he did not mean to say that their dividend was ever in danger, because they had made provision, even if there was a considerable diminution of profit, to pay a steady five per cent, as in former years. The remarkable thing about events during this war was that all prophecies appeared to have been falsified. Two years ago on the outbreak of war he had ventured to say in that room that it was very probable that in a small town like theirs they would be able to carry on their works without any interference, but it had been one of the industries most hardly hit by the war. All public lighting had ceased, the lighting of business premises had greatly been reduced, the price of coal for the manufacture of gas had gone up enormously, and the cost of labour had also increased considerably. Last year he had prepared the shareholders for a diminution of profit, but it was most remarkable that the past year should be the most profitable they had ever had in the history of the company. Their profits had been larger during the past year than on any previous occasion. However, they saw they were working with a shortage of storage under great difficulties. They consulted the best authorities they could get, and they all advised that they could make make-shifts, but the only solution of the difficulty was to put in a new holder. The expense was considerable — £1,600. The contract they had was a favourable one, and at pre-war rates. At the time improvements and extensions to gas companies had, owing to the war, come to a standstill, and the firm of contractors who had erected the holder were only too anxious to keep their men employed and gave them the favourable contract at pre-war prices. Since then the firm’s works had been largely employed in munitions and it would be impossible at present to obtain a contract from them at any price. If they had waited until after the war, the new holder would probably have cost them twice the money as there would, in all probability, be a regular rush on the part of gas companies for new holders, and things of that sort. The contractors would be so full up with work that companies would only get work done at very high prices. As directors they took their courage in their hands and finally resolved, in view of all the facts put before them from a proper source, to go in for the new holder. The bulk of the extra profits they had got had been brought about by the new holder. When they had the troops in the town they had used the gas in large quantities, and without that holder it would have been impossible to have met the sudden demand made upon them. In a month or two their sales went up by leaps and bounds and, of course, when the troops went away they dropped again. They had a very satisfactory gross profit of £2,176. In the coming year they would feel much stronger the effect of the Daylight Saving Bill, but they had increased their “carry forward,” which would provide for anything that might happen. He hoped that when they met next year the clouds of war would have passed away and that they would be once again basking in the sunshine of peace. The company would be fully equipped to deal with the increase of business which they might naturally expect after the war. 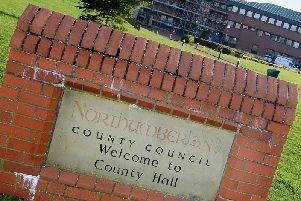 In keeping with other towns in the North, Morpeth is going to have two days’ holiday in lieu of those given up in the national interests at Whitsuntide and August Bank Holiday. The arrangements for having the holidays were made at a meeting of shopkeepers, their assistants, and the purchasing pubic held in the Town Hall the other evening, and the Mayor, who successfully organised the meeting, is to be congratulated on the lead which he gave in the matter. The fixing of the holidays for Monday and Tuesday next week was carried with unanimity, and the arrangement is altogether a most satisfactory one, inasmuch as it gives the tradespeople and their assistants what can be termed a long weekend, and a much-needed rest in these strenuous and anxious times. As there are no signs that the lighting restrictions will be relaxed in the coming months the meeting did well to consider the question of early closing. It was pretty evident from the discussion that ensued that the proposal met with approval, and when the feeling of the meeting was tested on the matter there was practically an unanimous vote given, it being considered that with darkened thoroughfares there would be little business to be done after certain hours. The outcome of the discussion was that a deputation was appointed to canvas the tradesmen in the town and see whether they were for or against the proposal and report to a future meeting. Of course, if early closing is adopted, the change will come into operation when the clock is put back again. There is a very great hardship in connection with the time spent by people who have to attend our military tribunals. Some people — and some of them women — have to stand about passages and stairways for as far as three hours at a stretch before they can be allowed to enter this sanctum sanctorum. That the members of the tribunals themselves have an arduous and thankless task is most certain, but that is no consolation for the people whose time is sorely wasted and their patience thus tried. They do things better at other places, where the people are advised to attend at varied times. Even if the tribunals had to sit a little oftener than they do it might be advantageous to all concerned. But we must not be too critical where the tribunals are concerned, for few there are who realise what a public service these members are performing. There are those who will not face the duties, to which they were appointed, but leave it to others to fight it out. There is no doubt but that anyone who desires to earn people’s undying enmity there is little more required than that they should become members of a military tribunal. Or if a man thinks he has a great store of patience or a meekness, which the beatitude tells us entitles one to inherit the earth, let him become a member of a military tribunal and listen to what the disgruntled applicants have to say concerning him if he ventures to express what he considers to be his duty. Tea was kindly given on Thursday by Mrs Elliott, Bede House, Oldgate, and realised £2 5s., a record for this season, and the committee were very pleased to welcome a number of new friends and helpers. Tea will be given next week by the Misses Harbottle and King, Bella Vista. At a meeting of the executive of the National Union of Scottish Mineworkers, in Glasgow on Monday, the question was raised of miners returning from military service to work in mines. Mr Robert Smillie, president, announced that he had had the matter before the Home Office and the War Office, and the War Office had stated distinctly that miners returning to the mines are to be absolutely free to go to any colliery they care to so long as they intimate to their commanding officers their address. They are sent to a particular mine because, generally speaking, they have been working there before and are known to the management, but the War Office are now issuing instructions that men returning to the mines for home service are not to be bound to any mine or employer, but are to have the same freedom as other workers at the mine. Their exemption from military service, however, is conditional on their being employed at mines. The secretaries inform us that the arrangements are well forward in connection with the above on Saturday 20th, a strong working committee of 50 having the canvassing of the various districts in hand. The following gentlemen will take part in the opening of the sale:— His Worship the Mayor (Ald. Ed, Norman), Mr George Renwick, and Major Crawford (chairman of the committee). The sale arrangements will be the same as last year. Poultry, butter, eggs, and sundries will be sold in the Market Place, and livestock and produce in the Cattle Market. Mrs G. Renwick, Mrs R. Crawford, Mrs Chris. Taylor, and Miss Renwick have charge of the flag day, and will be pleased to hear from those who are willing to assist. The committee feel sure there will be a good response to their appeal for this very worthy object, their motto being, “Nothing too large or nothing to small,” either in kind or cash. Messrs Thos. Waters and Son, Thomas Clerk, and R. Gray (Ashington) are hon. secretaries and auctioneers, and will be pleased to receive entries or donations. The great work involved in the National Registration Act is doubtless scarcely sufficiently realised, whilst there are lots of critics in regard to what are considered its shortcomings. The work which has devolved upon the police by it has been enormous, and will go on for some time to come. There are still to be found men who are of military age who have neither attested nor claimed exemption. At Blyth Court on Tuesday two men of this class were brought before the magistrates as absentees and were each fined £2 and handed over to the military authorities. This is a holiday week at the shipyards and docks on the Tyneside, and on all sides there is to be seen crowded trains and people gay in attire and demeanour and no end of money to spend. Next week we are to have three days’ holiday for the trades-folk. One would hardly think there was war at all. We have people who think they are enduring something because horse racing and football and other forms of sports are not allowed. We are a strange people truly! Mrs Hall, of 21 Marjorie Street, East Cramlington, has received word from her husband, Corporal G.W. Hall, of Trench Howitzer Battery, that he has been awarded the Military Medal. This is the third Cramlington man to receive the military medal. In connection with the national effort now being made to induce the people to save and invest their savings to help on the war, a promising association has been formed at the small colliery village of Linton, and affiliated to the National War Savings Committee in London. The following officers have been elected:— Chairman, Mr G.R. Ridley; secretary, Mr J.R. English; assistant secretary, Mr G. Dixon, jun., treasurer, Mr A. Graham; committee, Messrs A, Fail, J. Baxter, sen., G. Dixon, sen.
At their second contribution night on Friday last a membership of 68 was reached, and cash was taken for the two meetings sufficient to purchase 1,127 certificates at 15/8 each, maturing in five years to £1,127. Should anyone in the surrounding district care to try and form similar associations, which need not have more than a dozen members, and so help on the war (and incidentally themselves also), any of the above gentlemen will be glad to give any information or assistance in their power. The Commandant wishes to acknowledge the following gifts with many thanks:— Eggs from Miss Pringle (Tritlington), Mrs Lamb, The Secretary, Soldiers’ Fete, Kirkwhelpington, Mrs Spence, Mrs Pringle (Tritlington); fruit and vegetables from Miss Appleby (Smallburn), Mrs Coble, Mrs Poynting, Miss Jackson; cakes from Mrs Joseph Simpson and Miss MacDowall; milk from Mrs Berkley; sheet and bolster case from Miss Hopper; papers from Mrs Clayton; flowers from Mrs Philip; tea and handkerchiefs from Mrs Gutherson, Ulgham; butter from Mrs Spence.